Supercritical fluids exhibit processing characteristics that industry's more traditional extraction, fractionation, and recrystallization methods cannot equal. In response to these limitations, Phasex continues to develop superior processes and products based upon the unique extraction and separation properties of supercritical fluids. Supercritical fluid technology finds application in polymer purification and fractionation, particle size reduction of pharmaceuticals, extraction and concentration of actives from natural products and nutraceuticals, and purification of fine and specialty chemicals. And typical benefits include increased yields, superior quality, and solvent-free products. Phasex provides Feasibility Studies, Research and Process Development, Tolling Operations, and Technology Licensing to these industries. 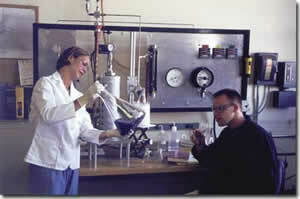 If you require supercritical fluid extraction, purification, fractionation, or recrystallization services for any current or potential process or product, or if your product suffers from the limitations of more traditional processing, Phasex Corporation possesses the technical expertise, breadth of experience, and facilities required to achieve your success.